Your sub is installed and set up as best you can, but you can't quite get it to sound right. Some frequencies are too prominent, while others seem subdued. If this sounds familiar, then this equaliser is what you need to fix it. It is not a panacea, and will not cure an impossible room, but the majority of lumps and bumps in the subwoofer response will respond very well to an equaliser as described here. 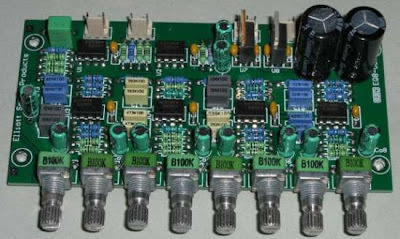 The unit is an 8 band variation on the expandable equaliser described in the Project Pages, and is dedicated to its task. Boards can be stacked to get more bands if desired, but the arrangement shown will be quite sufficient for most installations. The equaliser is a constant Q design, so unlike most "ordinary" equalisers, it does not have a very low Q at low settings of boost and cut. This is a major problem with the standard (graphic) equaliser circuit, and is completely avoided by the constant Q version. Using the Multiple Feedback Bandpass design, these filters can be designed for any (reasonable) frequency and Q desired. As a 1/3 Octave equaliser, the filter Q should be 4.3, but I have deliberately lowered this to 4 for this design to allow a little overlap. While there will always be "that" room which defies all attempts to make anything sound halfway decent, this EQ will dispose of the majority of problems likely to be encountered.